These days, cauliflower rice is the MVP at Hungryland. 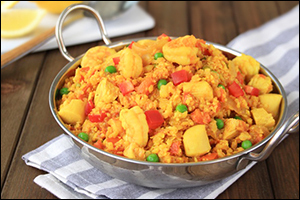 And in this mixed paella dish, it reigns supreme once again! Pulse cauliflower in a blender until reduced to rice-like pieces, working in batches as needed. Transfer to a bowl. Sprinkle with 1/2 tsp. turmeric, 1/2 tsp. paprika, and 1/8 tsp. thyme. Mix well. Bring a large pot (with a lid) sprayed with nonstick spray to medium heat. Season chicken with 1/8 tsp. each salt and black pepper. Cook for about 4 minutes per side, until cooked through. Transfer chicken to a cutting board. Remove pot from heat; clean, if needed. Re-spray, and bring to medium-high heat. Add onion, bell pepper, and garlic. Cook and stir until veggies have softened, about 5 minutes. Add tomatoes, cayenne pepper, and remaining 1/2 tsp. turmeric, 1/2 tsp. paprika, 1/4 tsp. each salt and black pepper, and 1/8 tsp. thyme. Cook and stir until tomatoes have softened, about 3 minutes. Add cauliflower, peas, broth, and bay leaves. Bring to a boil. Add shrimp, scallops, and chopped chicken. Cook and stir until seafood is fully cooked, about 5 minutes. Add lemon juice and stir. Cover and remove from heat. Let stand for 10 minutes. 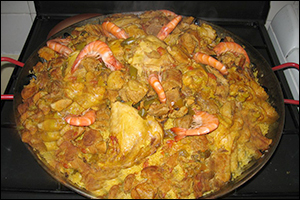 Share the paella -- click "Send to a Friend" now!